Part of the fun in An Idiot Abroad’s second season comes from the surprising way Ricky and Stephen—or whoever it was that actually planned out Karl’s agendas—go about getting him to his bucket list destinations. The show has always enjoyed throwing random surprise hurdles in Karl’s path, but the second season seems more intent on screwing with the formula. We saw a huge twist of this last week, when they switched Karl’s “swim with the dolphins” item into swimming with sharks, but it’s an important part of the show every time out, particularly because the items Karl chose were largely about looking passively at things. He’s not an active person, so in order to get anything on-screen other than him sitting in a room complaining, you have to force him out there. In this regard I’m extremely impressed by whoever plans his itineraries, because they manage to find uncomfortable situations for Karl wherever he may be. For instance, forcing Karl to walk through the snow when he arrives in Alaska doesn’t sound very entertaining to me. He’s most dynamic when uncomfortable around people, but it’s a scene that works well, and also helps to differentiate this episode from other ones. Episodes of An Idiot Abroad’s second season have the virtue of differing tones, which was at times missing in the first season. Karl is still always pissy, but this episode somehow did a better job of isolating Karl than when he’s visiting areas where he cannot speak the local language. Frequently in “Whale Watching” it was just him and the cold weather, which itself became a character that Karl was constantly in the presence of and hated completely. 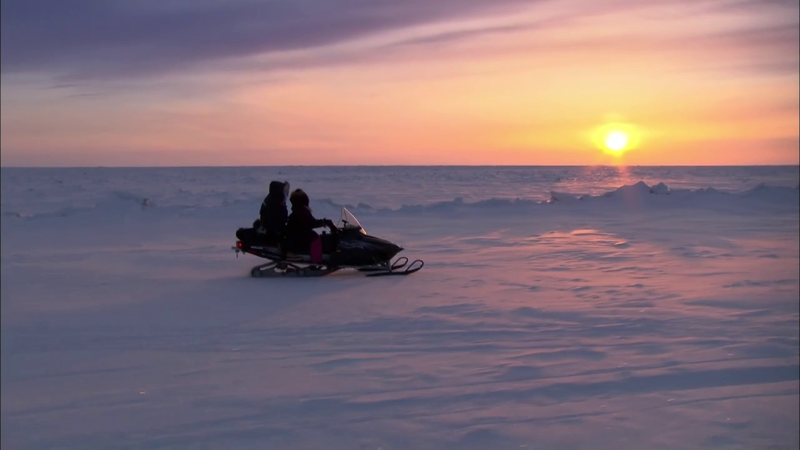 Karl next heads to the northernmost tip of Alaska, Barrow, which he’s told on his way up doesn’t have much going for it. In the show’s continued attempt to make Karl more tolerant, he’s soon greeted by some Inuit women and eats raw whale. At this point of An Idiot Abroad, he’s more than happy to just stick whatever’s offered to him in his mouth, but it’s still entertaining. One of them even takes him to the most northern point on the Earth, where he is typically unimpressed. There are some shots here that match up with what we see later when Karl is floating alone in the water, with him in both cases surrounded by nothing but the cold around him. Karl’s surprising reaction to collecting the human waste from houses, which he dislikes actually doing but rather appreciates otherwise, is perhaps a bit too easy. He’s then taken dog-sledding in a section with some photographic animals that isn’t too interesting otherwise, before heading out to the water. Karl’s taken by glaciers, and I was happy that Karl could at least appreciate seeing glaciers disappear before his eyes a little bit. However, it’s really the episode’s end that steals the show. Karl does in fact get to see whales, but he’s sent to do so on a fishing boat where the crew expects him to help gut the fish. The combination of noxious fish fumes, exhaustion and seasickness means that when the whales finally appear over the side of the boat Karl barely has the strength to look up. It’s an episode that succeeds at actually making you feel badly for Karl, which is no easy feat. •I would really like a list of fantasy creatures that Karl thinks are real and actual people that Karl thinks are fantasy. •Karl takes the Republican view of global warming: I see ice in front of me, clearly it must not be true. •I appreciate how much the guy leading Karl’s walk keeps laughing at him. I also appreciate Karl having to go on a walk, simply because it’s one of his go-to answers for things he’d rather do than be on the show. •That man leading him is an awful lot like Ricky Gervais, and takes a similar delight in annoying the hell out of Karl. •There was some gorgeous cinematography this week, even for a show that prides itself on how good it looks. •To Karl, saying you’re on top of the world is like saying you’re over the moon. •I do really love the quip that it’s a waste of time having this episode in HD, let alone in color. •Now that Karl has experienced chamber pots, he’s decided he prefers them to indoor plumbing. That’s where that idiot part of the title comes from. •Every time Auntie Nora gets involved, you know an even crazier than normal theory about the world is about to arrive. •I can’t be the only one who found Ricky’s obsession with Karl getting a prostate exam to be as strange as Karl thought it was. •Unless I remember incorrectly, the intro of King Kong is, of course, a long boat ride.